A hearty and delicious, restaurant style Chinese Hot & Sour Soup, comforting and perfect for cool autumn evenings. Set aside 1/4 cup of the Beef Bone Broth for later use. 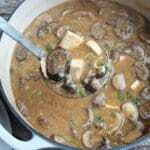 Add the remaining Beef Bone Broth to a Dutch oven or large pan along with the mushrooms, rice vinegar, soy sauce, ginger, chili garlic sauce, Stir Fry sauce, and maple syrup and stir to combine. Heat over medium high heat until the soup begins to simmer. While the soup is heating, whisk together the 1/4 cup of bone broth and the cornstarch until completely smooth. Once the soup has reached a simmer, stir in the cornstarch mixture and stir until the soup has thickened. Continue stirring the soup in a circular motion, then drizzle the beaten eggs in slowly, in a thin stream, all while continuing to stir the soup. Cut the tofu into bite sized cubes and add it into the soup, along with the seasame oil and the green onions thinly sliced. Remove and discard the white, bulb end of the onion and only use the green portion. Season the soup lightly with the ground white pepper, stir to combine, and then serve immediately, or turn the heat to simmer and allow to simmer for a couple hours to allow for a more vibrant flavor. Serve hot with crunchy wonton strips and egg rolls and enjoy!